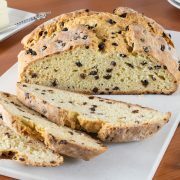 I saw this recipe recently on the Food Network for Ina Garten’s Irish soda bread that sounded delicious and fun to make. There is no yeast involved in this bread making so it’s much less intimidating and actually quite simple to throw together. The loaf smelled amazing while it baked and tasted even better. We slathered pieces fresh from the oven in butter and it was wonderful! I especially loved the bits of sweet/tart currents in each and every bite and the subtle hint of orange from the zest. I was curious how my kids would feel about this soda bread since it isn’t sweet, and it turned out just as I thought it would – my daughter enjoyed it and my son wasn’t a big fan. 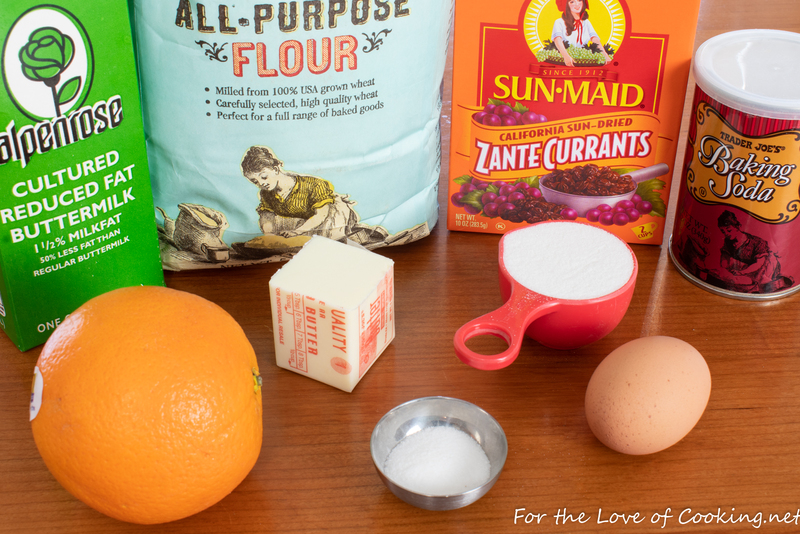 Combine the flour, sugar, salt, and baking soda together in a bowl of an electric mixer fitted with a paddle attachment (or a hand mixer will work too). Add the butter and mix on low speed until the butter is mixed into the flour. Whisk together the buttermilk, egg, and orange zest in a separate bowl until very well combined. Slowly add the buttermilk mixture to the flour mixture and mix until just combined. Add a tablespoon of flour to the dried currents and mix until evenly coated. Side Note: This step helps ensure the currents won’t sink to the bottom of the loaf while baking. 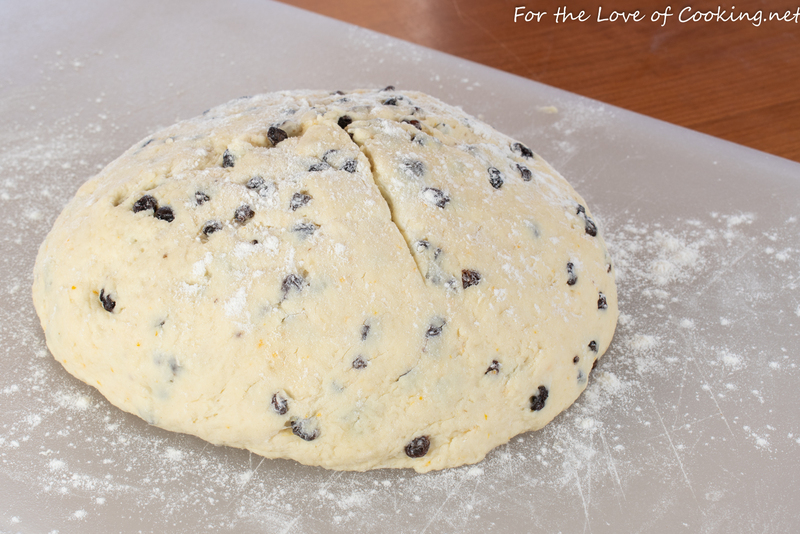 Fold the dried currents into the dough until evenly combined. Dump the dough out onto a floured board and knead it a few times into a round loaf. Place the loaf on the prepared baking sheet and lightly cut an x into the top of the bread with a serrated knife. Place into the oven and bake for 45-55 minutes, or until a cake tester inserted in the center comes out clean. When you tap the loaf, it should have a hollow sound. Cool on a baking rack. Serve warm or at room temperature. Enjoy. Combine the 4 cups of flour, sugar, salt, and baking soda together in a bowl of an electric mixer fitted with a paddle attachment (or a hand mixer will work too). Add a tablespoon of flour to the dried currents and mix until evenly coated. Side Note: This step helps ensure the currents won't sink to the bottom of the loaf while baking. Fold the dried currents into the dough until evenly combined. Place the loaf on the prepared baking sheet and lightly cut an x into the top of the bread with a serrated knife. mmm…my favourite! So good when it’s fresh and hot out from the oven! I need to bake one too. Mark picked up an Irish Soda Bread from our supermarket’s bake shop. They include malted barley powder in their bread, and it gives it a very nice flavor. 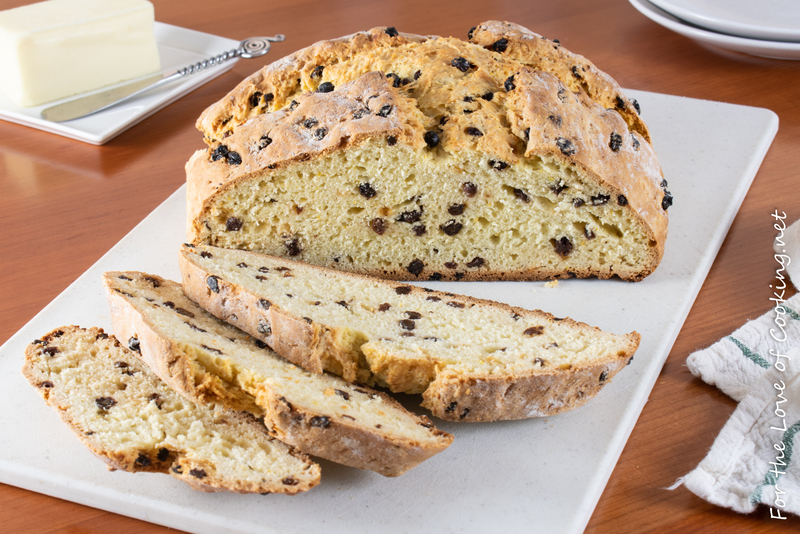 I’ve never made Irish Soda Bread, but yours looks delicious with its hint of orange. This is the best. Going to make this for Sunday. 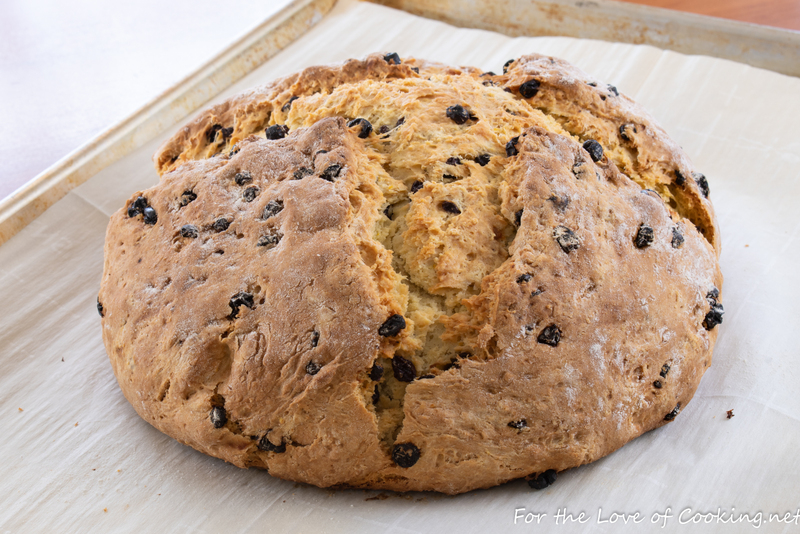 I’ve never really loved soda bread but this has me wishing for a warm slice right now!